This entry was posted on Monday, January 23rd, 2012 at 05:45 and is filed under Election 2012, Mitt Romney, News, Newt Gingrich, Politics, Sarah Palin, Tea Party. I want to take a moment to address in more detail that which I have watched from afar, and only commented on briefly as what had been more or less a bullet point in a larger story, but if you really want to know what elevated Newt Gingrich to a runaway victory in South Carolina, it goes back to one moment. Although she appears on Fox News regularly, particularly now that the primary season has begun, Governor Sarah Palin’s hat-tip to Gingrich on Sean Hannity’s television show was the key moment. Looking at the polling data, it was clear that Gingrich’s big night in the Fox News debate on Monday cracked the door open, but when Palin declared to Hannity that she would vote for Gingrich were she a voter in South Carolina, that little mention, surely not a full endorsement, shoved open the door and sent many thousands of the Mama Grizzly’s most ardent supporters and friends out in the pursuit of that end. If you had wondered what a Palin campaign might have resembled, you have witnessed now only a sample. In an effort made of devoted pursuit, across South Carolina, Tea Party members heard Palin’s words as the signal, and to the polls they went and beat back Mitt Romney, by lifting up Gingrich. The breaking of the news of an ongoing struggle inside ABC’s executive suites over the Marianne Gingrich story was launched with the intent of arresting this movement, the idea being to head it off quickly. A story that had been intended to destroy Gingrich in the last moments of the week(despite the official story at ABC,) was instead brought into the light and exposed for the slimy bit of manipulation it had been. Across the Internet, people dug through old stories, and dug up old information, and before the story had festered six hours, it was already being put directly to bed. ABC moved it up, first to Friday night, and then to Thursday, but the obvious nature of the ploy was something that the Tea Party, and particularly those known as “Palinistas,” had seen and witnessed many times before. Repeatedly, over the last three and one-half years, supporters of Palin have watched as similar attacks were launched in Palin’s direction, but with much less scandal behind it. Part of the scheme they had learned to notice had been the way timing was always employed to maximum effect. None who saw the flashing light on Drudge Wednesday evening had any illusion about the nature of the attack. On Thursday morning, when Rick Perry announced the suspension of his campaign, he made a powerful statement about the fallibility of all mankind and the redemption possible to any who seek it. He stepped forward boldly, in the midst of the continuing theme of attack against Gingrich, and endorsed the former Speaker of the House in spite of the media. This small moment of confirmation made it clear to many who followed his speech that he was clearly rejecting the media narrative and timing. A little while later, Governor Palin tweeted her respect and admiration for Rick Perry’s patriotic message, and this served as confirmation to many that the Newt train would leave the station on schedule. After that, almost nothing else mattered except for Gingrich’s own rebuke of the media on Thursday night, so that when the interview aired of Marianne Gingrich, the few who sat through it were Romney supporters looking for a new source of dirt. While all of this went on, through the night and into the morning, Tea Party folks in South Carolina rose to make a stand. They began to volunteer for Gingrich, and they got out the vote for him in epic fashion. One could hear the faint echos of the roar drifting down from Wasilla, Alaska, but more importantly, one could see it in the frenzy of activity around Gingrich’s campaign operation. There was only one source of this momentous surge, and Gingrich acknowledged it thankfully, and well he should have, because while he might have managed a victory without Palin’s shout-out, the truth is that he would never have accomplished it under such a withering and well-timed assault without all of the Palinistas and Tea Party folk who responded to her call. Seven in ten people who voted for Gingrich said they were Tea Party, or Tea Party-aligned. As Romney campaigned, mostly ignoring the Tea Party, Palin’s small hat-tip in Newt’s direction sealed the fate of the Mittster. The injection of this sort of impetus into a race is almost unprecedented, but for her own previous engagements. Her ability to guide and shape the outcome is a phenomenon of which every other politician in the country is now unhappily aware. They saw the effectiveness of her campaigning and endorsements in 2010, and they noticed that she carries elections at least twice as often as she doesn’t, even in tough regions. They also know now the terrible force of her slimmest positive mention in favor of their rivals. What this points out most of all, however, is how quickly the Palin-inclined Tea Party can muster when they see a clear choice. Palin simply provides the clarity, and since they know her record of earnest reform, they tend to give greater weight to her judgments. There is one more thing about all of this that I haven’t seen mentioned, but it’s noteworthy, and I offer it to you as evidence of my thesis: I believe that even at this late date, if the Mama Grizzly decided to do her own roaring, she would quickly dominate the field. I know that’s wishful thinking, and I realize the likelihood is something less than the discovery of a warm personality in Mitt Romney’s suit, but it bears repeating outside the confines of my narrow skull. The effective nature of Palin’s influence in South Carolina should offer you a hint of what she could bring to bear on this or any campaign, and I look forward to seeing her in full support of the growth of the House majority, and the overturning of the Senate, but most of all her committed and forceful leadership in the matter of “sudden and relentless reform.” Our country desperately needs it, and even if she will not have seek an office, her leadership will be needed more than ever. In Washington, they’re fearful, and the GOP and media elite are listening intently for the sound they dread, should the Mama Grizzly begin again to roar. Thanks Mark, Your article was like reading "The Night before Christmas" :)) Loved it! I read with interest your post: New Establishment Media Themes Emerge (great post btw). If your thesis of this scenerio plays out, that is when I could see Palin jumping in. 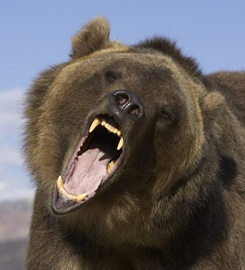 When Mama Grizzly roars *everyone* hears and it is a marvelous thing to behold. Excellent, Mark! Agree with you in everything you said. Including your wishful thinking. GREAT article! Thanks. Go, Sarah, go! Always love your thoughts and comments. I remember not sure it was Hannity, but the Gov also mentioned Willard's tax returns. Now it is front and center! She is really a great force, greater than all GOPs combined. Go Sarah! Great article, Mark. The gop elite and the lame stream media must be fuming! Hahahaha! Keep up the pressure people, we can save our country! Run Sarah Run! Tea! Leadership and honesty ~ used to be 'The American Way.' There is now such a thirst for someone who exemplifies the character and capability. Governor Palin is doing what she does best: lead by example. Thanks for the fine analysis, Mark. Nice column Mark. Sarah Palin yields a big stick, she is the E.F.Hutton of Politics, she speaks people listen. Another issue here is the impact on Nikki Haley who had endorsed the Mittster, in the end going against the Tea Partiers who put her in office. She's looking pretty foolish when a mere comment from the Lady from Alaska on a Fox News show puts Newt over the top against her candidate in her own state.